If you have an outdoor space that could use some floor protection or just what to define the different areas, dining and sitting, an outdoor patio rug will do this for little money or effort. I have an outdoor patio area down at the lake that is a concrete pad. 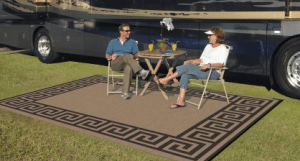 I was looking to protect the bottom of the legs to my table and chairs that I dine at during time at the lake, I looked at outdoor patio rugs for a solution. I am very happy with my choice. I will look at several options for your outdoor space in this article. There are very many options to look at with these rugs, color, material, loop type and how durable they are in the outside environment. Now lets look at the details of each type of rug. Multi-colored stripped design. Will fit any decor color. Available in a 8 X 5 foot size. Flower design in a 5 X 8 and 8 X 10 foot sizes. A blue zig zag design in a 5 X 8 and 8 X 10 foot sizes. 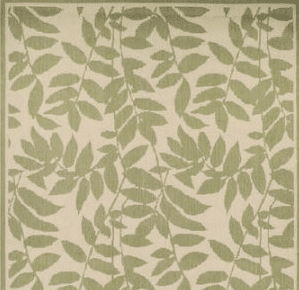 This rug is made with a stain and soil resistance nylon upper and marine backing material. The backing will keep the moisture off of the rug material. Cleaning should be done with a vacuum or broom. Can be used indoors just as well as outdoors. Lila Medallion is available in an aqua blue or brown beige design. It is designer circles on a solid background. It is available in four sizes from 52 inches by 83 inches up to 94 inches by 120 inches. Prices start at around $25 for the smaller rug up to $72 for the larger size. 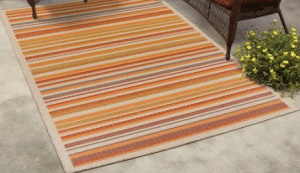 Robins Stripe is a multi colored striped rug. The only size is 52 inches by 83 inches and is around $30. All Over Leaf beige background with a green leaf pattern. It is available in four sizes from 52 inches by 83 inches to 94 inches by 120 inches. Prices start at around $25 for the smaller rug up to around $64 for the larger rug. 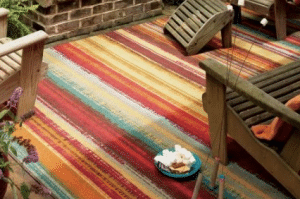 This rug is made from a Polypropylene material for durability in any outdoor area. Can be cleaned with a hose and water or just sweep off. Lays flat easily after storage. Only comes in the green grass color. Comes in three sizes 4 foot by 6 foot, 6 foot by 9 foot, 8 foot by 12 foot. Prices start at $18 for the smaller rug up to $80 for the larger rug. 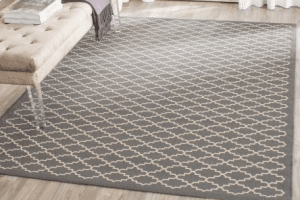 This rug is made from a 100% Polypropylene material, using a backing material will keep in place. It has a finished edge for a finished look. 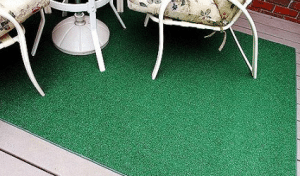 It is very durable and the green color is fade resistant. Cannot cut to size, will start unraveling. Washes clean with a hose. The Safavieh line of outdoor patio rugs has a lot of different styles and sizes. Prices start at under $20 for a small throw rug to over $100 for a larger area rug. Many matching sizes with the same pattern are available. This line of outdoor rugs will be detailed further in another post. Product is power loomed with a polypropylene material in Turkey. No backing material on this rug, you will need some backing to keep in place. The Better Homes and Garden line of outdoor rugs will come in ten different styles with sizes and colors for each style. I will cover this line in another post. All of the styles are made from a polypropylene material and will be very durable outdoors. Light grey middle with a darker grey boarder. Not reversible and does not have any backing material. Available in the following sizes, 5 foot 3 inch by 7 foot 6 inch, 5 foot 10 inch by 9 foot 2 inch, 3 foot 9 inch by 5 foot 5 inch, 8 foot 6 inch by 13 foot, a runner at 2 foot 3 inches by 11 foot 9 inches, 2 foot 3 inches by 7 foot 11 inches. Also available are a round and square rug to match the design. Starting at $19 to almost $185 for the biggest rug. This rug is made from a flat weave 100 percent polypropylene material very durable in any outdoor conditions. Material is rough if you have little ones that want to crawl on it. Light weight, may need furniture on it to keep in place. Dries quickly after getting wet, even on concrete surface. Has different color pattern on each side of the rug. 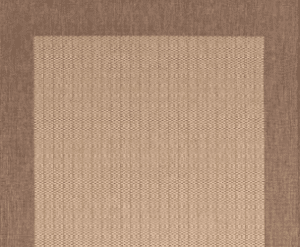 The boarder is a scrolled design with a dark brown scrolled design with beige center. Other side has the colors reversed to make a darker center with lighter scrolled design. Has loops on corners for tie downs to keep in place. Has loop when rolled up to carry rug to another place or store it. It only weights 9 pounds for easy portability. Only comes in the 9 foot by 12 foot size. This rug is made from 100 percent polypropylene. It is made to breath so that it will not kill your grass if you leave it for a few days. This is a great rug for a camping trip, to give you a place to sit or wipe your dirty shoes before entering your camper or tent. Can also be used for putting under tent when camping. Very durable and will not hold very much water after a rain. When unrolling after storage, takes time to lay flat. Easy to clean, just sweep or wash off with hose. When looking to define your outdoor space or room, one of these outdoor patio rugs will give you a different dimension. Needing to separate your dining and sitting area, add an outdoor rug and you will have separate spaces without walls. Giving separation without walls will give your guest the feeling that everyone is in the same room. I have one of these rugs for protection of the legs for my patio table and chairs at the lake. I put it in the garage when not needs and it is very easy to get out and lays down without any trouble. Very little maintenance is needed, just a sweep or run the hose over it to clean. If you have any questions, experience with these rugs or comments, use the forms below and let me know. Have an item you need more information on, leave me an email and I will get back to you shortly. 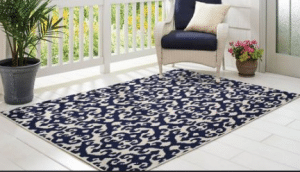 Excellent post on outdoor rugs and how they should be used. Having an outdoor space that you can define with a rug will give you more of a feeling of extending your inside space. I like having outdoor spaces that give the feeling of a room, an outdoor patio rug will do this will little cost. Shoot, now you have done it. I love the rugs. 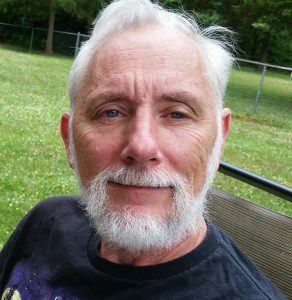 I have decided to put my house up for sale, and just waiting until it is sold. Then moving to the sunshine state. Once there, I can actually purchase these rugs, and seating that you recommend. I love the rugs, they are great! You were the one that inspired me to find more information about these rugs. My rug is protecting my furniture down at my lake property. I hope you have good luck in selling your property and moving to Florida. Thanks for sharing. I just bought a rug and it can make a massive difference to a room. Really love the look of the Lila Medallion. Will have to consider that when I need a new rug in the future. These outdoor rugs can define your outdoor space. If you have a large space, you can make different rooms without having walls. Wow I really like these ideas. We spend a lot of time outdoors in our yard in the summertime. I will definitely come back to your site and get some new ideas for our outdoor living spaces. Thank you for sharing your ideas and places to acquire the various products. Living outdoors is my life. Giving people ideas on how to improve their outdoor spaces is what this site is about. Thanks for your comments. Having an outdoor room will give you the freedom from being cramped up in a house or apartment. When I get outside it is like getting freedom from the worries of the world.